The Lorne Pier Seafood Restaurant comes highly recommended by hotel staff and tourist pamphlets in the small seaside town of Lorne, located along the famous Great Ocean Road. We were visiting for a long weekend over Valentine's Day and although the weather was unseasonally cool, we were going to enjoy a quality meal by the beach. Unfortunately we hadn't booked a table by the window but sat in a cosy corner for two and our night was all about fresh seafood. We began with an entrée of sweet Thai prawns which were so divine, we wanted to ask the chef his secret recipe for the sauce. The prawns were large, plump and juicy and the sauce creamy. For mains, I decided to eat up big, much bigger than I had anticipated. I ordered the seafood platter for one- yes it stated for one. What came was everything I could have wished for. 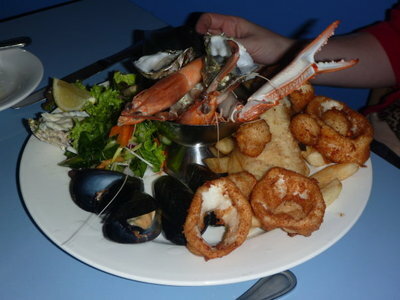 Oysters, mussels, crab, smoked fish, whiting, calamari, fried scallops, cooked prawns and small whiting. Somehow I managed to polish off the lot of it! My seafood platter for one! My partner ordered the barramundi with sweet chilli and mustard glaze. The fish was cooked perfectly and there was plenty of sweet flavour with a welcome kick from the chilli seeds. The menial serve of chips, however, were soggy as the wet fish had been served on top of them. We left well and truly satisfied and fished-out. We've added it to our highly recommended list too, but maybe dine in early and get a window spot to watch the sun set over the water.